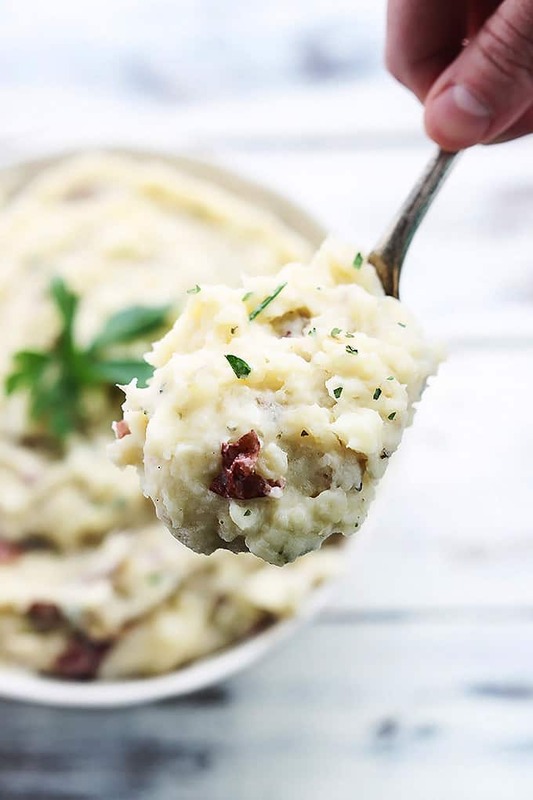 Creamy, buttery garlic and herb mashed potatoes made right in the slow cooker! 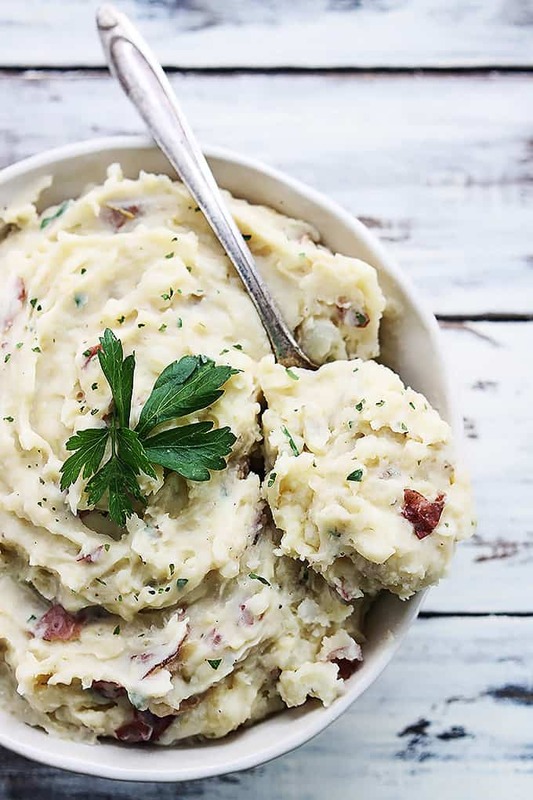 These are the easiest, best tasting mashed potatoes you will ever make! It’s baaaaaack! 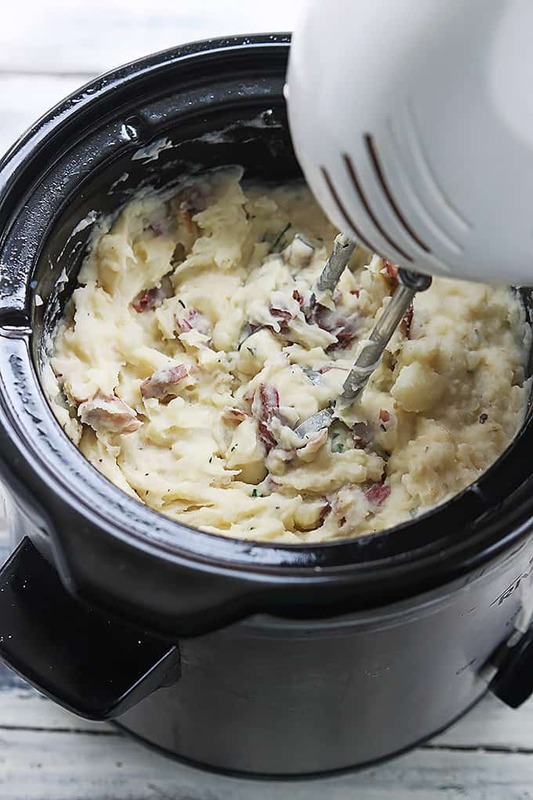 Slow cooker mashed potatoes are making a new appearance here on the CDLC blog. My original Slow Cooker Mashed Potato recipe is by far the most popular recipe on this entire blog. Apparently y’all are as obsessed with ridiculously easy and perfectly creamy mashed potatoes as I am. You and me, we’re two peas in a pod I tell ya. Which is why I just know that you are going to l.o.v.e. 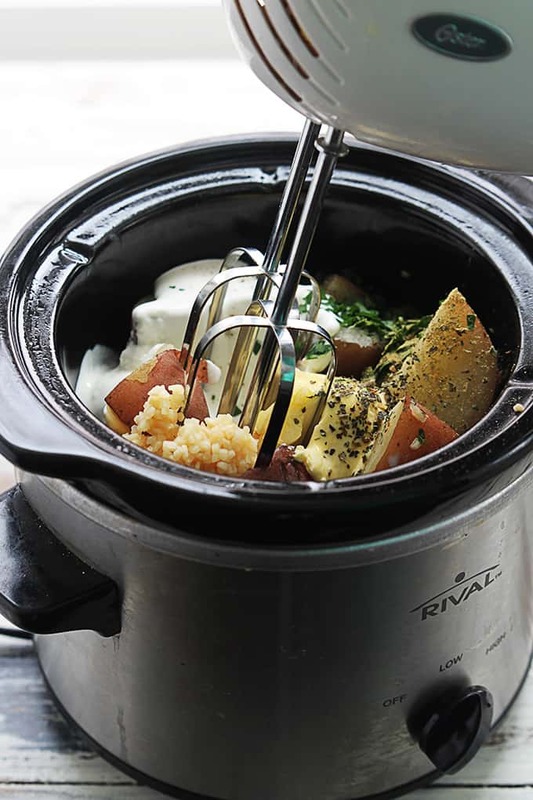 this new slow cooker mashed potato recipe. Today we’re adding butter and garlic and bright herbs to a classic side dish so you know it’s gonna be good. Now let’s break it down. 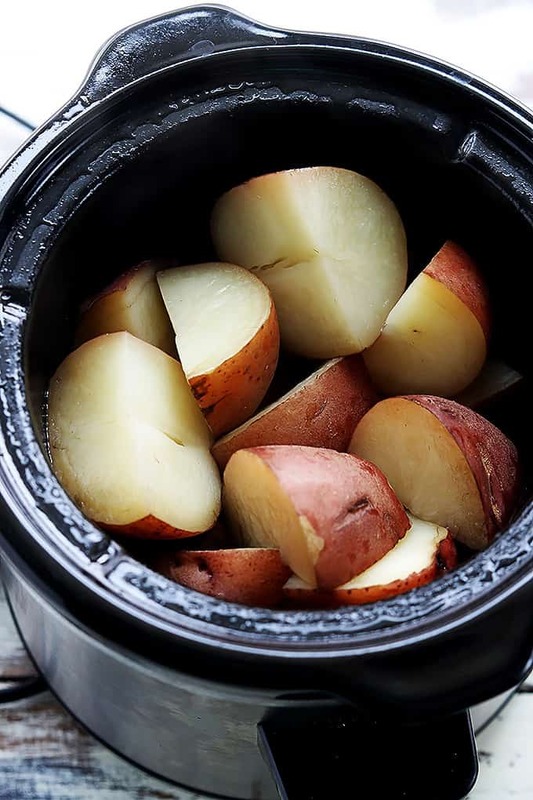 All you do is add some chopped red potatoes to your greased slow cooker. That’s step one. And I’m just going to answer your question now because I know that it’s coming – NO you don’t not need to add any liquid to the pot. Just the potatoes. Pretty cool huh? Plus you can leave the skins on! Red skins in my mashed potatoes make me swoon. After 2-3 hours of cooking on high (or 5-6 on low) you add the rest of the ingredients. ALL of them. Just dump them in, no need to be graceful about it, we’re about to make a mess anyway. Now get your hand mixer out and whip those babies up until they’re pretty smooth but still have some chunks of potato throughout. I just pulse the mixer until I get the texture I want. These potatoes are not meant to be perfectly smooth – they are real potatoes, not instant potatoes. Let them keep a bit of texture! If you want, you can also use a masher. It’s totally up to you. 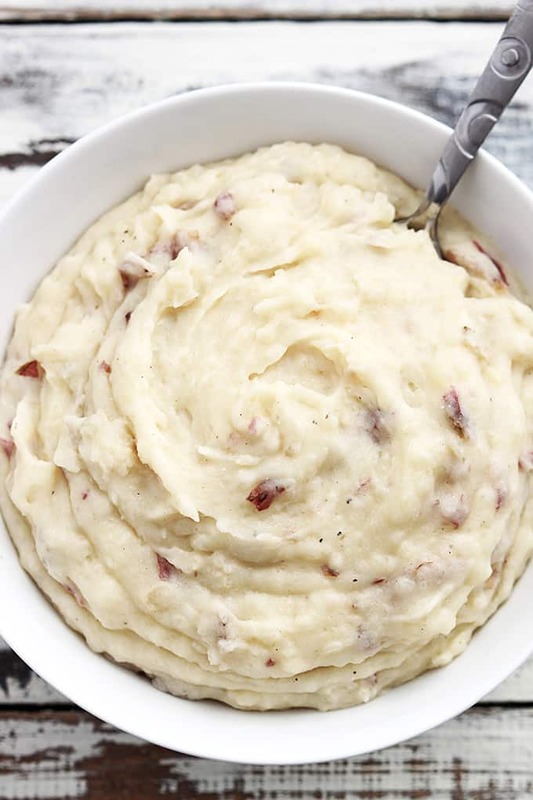 But be sure to check out my tips for perfect mashed potatoes – if you aren’t careful you can end up with “gluey” mashed potatoes. I’ve never had this happen to my potatoes but enough people have been disappointed in their own mashed potatoes that I’ve included some great tips for avoiding that crisis. And that’s it! Seriously. 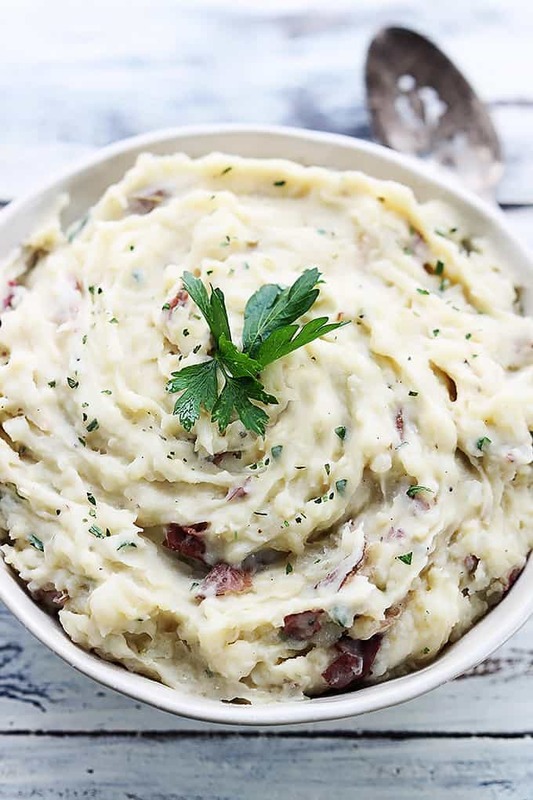 Perfectly buttery herb mashed potatoes that you made in the crockpot so you didn’t even have to take up any stove or oven space. Thanksgiving is saved. 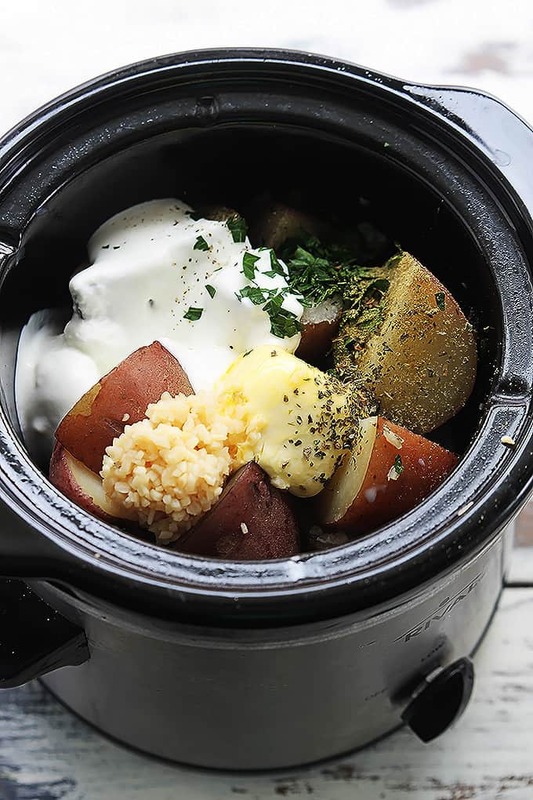 Add chopped potatoes to a greased slow cooker. Cover and cook on high for 2-3 hours or on low or 5-6 hours on low. When potatoes are cooked and fork-tender, add all remaining ingredients (let the butter melt for a couple of minutes). Use a hand mixer or a masher to mash the potatoes. (*see note) Serve warm. **This recipe can easily be doubled for large groups – just increase the cooking time by 1-2 hours. **Although I have never had this happen to my potatoes, I have heard some people complain of “gluey” potatoes after mashing. Click HERE for my tips on making perfect, never-gluey mashed potatoes!